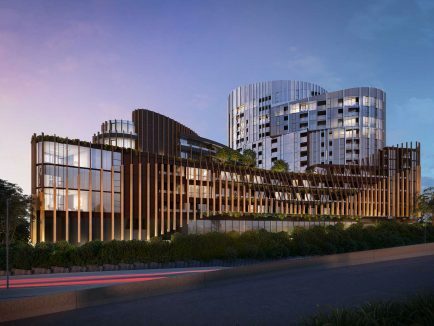 New Australian hotel group Veriu is carving out a fine niche in the boutique accommodation market. We check in, to check out, the ‘millennial modern meets 1920s Hollywood’ gentrification of Sydney’s Wentworth House, reimagined as Veriu Central. 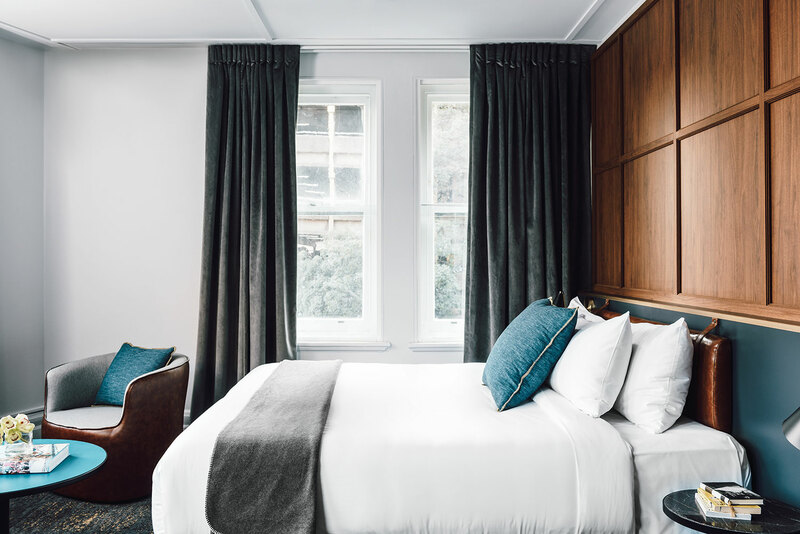 With Australia’s increasing demand in smaller-scale boutique hotel experiences comes a gentrification of inner urban historic properties; and with this we should be thankful. These previously forgotten gems of our cities are often well positioned, offering great convenience for travellers. Wentworth House, a heritage listed inter-war period former apartment block situated on the corner of Wentworth and Elizabeth Streets, Sydney CBD, is one such property. 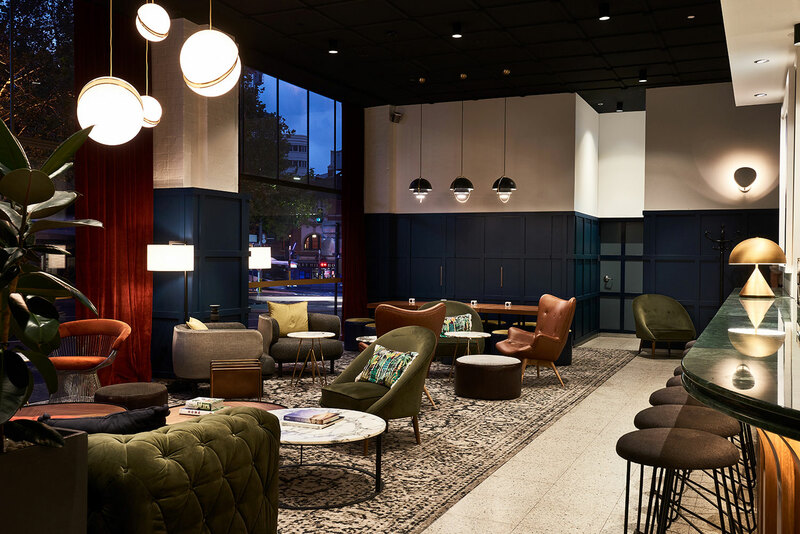 Its recent transformation into the urban-cool Veriu Central Hotel provides a welcoming and refreshing choice, coupled with a street-smart location that connects visitors to the historic bones of the city. 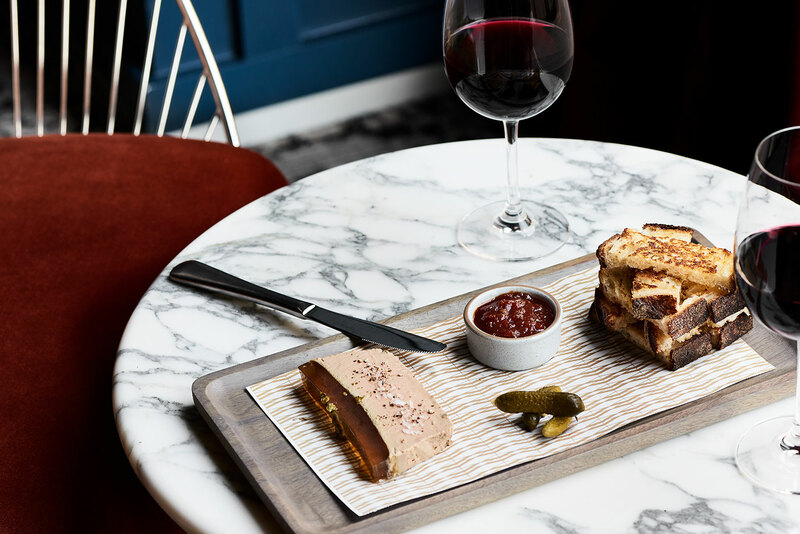 Veriu Central is a stone’s throw from Central Station and the Surry Hills – a hapening area whose side streets are dotted with top eateries like Nomad, Fink Group’s Firedoor and Luc La Joye’s quaint traditional French bistro Loluk. Designer retailers and some of Sydney’s hottest business collectives are tucked in between. The district is also a hub for small business with a range of creatives nearby such as start-up tech companies, food and travel media and trend-setting boutique retailers. Entry is from Wentworth Street with a loading zone at the door and car parking literally metres away. We step inside to admire The Drawing Room with its deep peacock green-panelled walls, plush velvet curtains, lovingly upholstered designer arm chairs in leather, velvet and soft fabrics, that marry so well with the brass-edge marble topped and walnut veneer side tables. Warm interior accents of gold and bright peacock green complete the look – overall a decidedly modern take on classic 1920s design. The Drawing Room offers a light menu of perfectly curated bites. To one side of the room a small section of the impressively stocked cocktail bar doubles as a check-in counter. 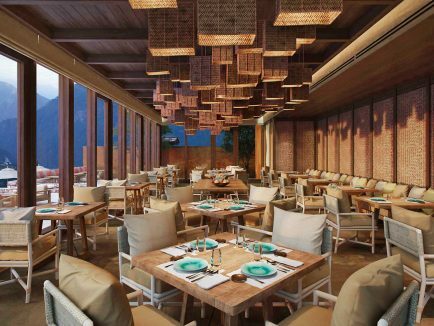 Topped in emerald green marble and featuring bentwood timber ribs below, the cocktail bar frames the room, its organic ribs subtlety emphasising Art Deco’s often curvilinear architectural style. In the lounge area a cluster of split spherical chandeliers illuminate a huge olive green eight-seater velvet sofa. The rich mix of leather and velvets are complimented by designer carpets, indoor palms and a large contemporary art print by Australian photographer Ted O’Donnell. 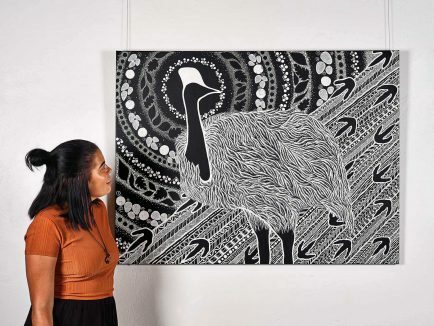 This work is grand in scale and most certainly steals the show. The Drawing Room is the place for drinks and bar snacks and is a great social space. Come morning, the hotel’s complimentary coffee/tea and cinnamon scroll offering is a friendly wake-me-up. Other less-than-fussy breakfast options include: croissants, house granola with vanilla yoghurt and berries, and a choice of designer jaffles – with the Ibérico de Bellota Jamón and taleggio cheese being our favourite choice. These breakfast bites are perhaps designed as quick fill-me-ups for business types on the go. But if you want to slow down, well-respected cooked breakfasts are a only few footsteps away at Basket Brothers which offers a long list of brekky choices like beef brisket hash, eggs Benedict, truffled mushrooms, turmeric lattes and espresso coffee. Veriu Central’s staff, mostly of international origin, are highly trained, personable and a joy to encounter. We met guys and gals from England, Hungary and the Czech Republic. While they might not be here for the long haul, it’s evident that they’re carefully chosen, skilled hospitality professionals who prove super helpful – absolutely no request was too much trouble during our stay, including finding a microwave at 2am for a troublesome 18-month old demanding warm milk. The Drawing Room that forms the hub of the hotel moonlights as a cleverly curated cocktail bar. The Drawing Room that forms the hub of the hotel moonlights as a cleverly curated cocktail bar. Our barman pours us the Veriu 313 house gin produced by Ironbark Distillery, North Richmond, NSW. It’s complex and aromatic, made with Ironbark’s signature chai spice blend, juniper, passionfruit, forest berries and vanilla. It’s a fantastic gin to single out and sample as a shot, as it holds its own so well. Regardless of its individual qualities, we change tack and next try the Eastside cocktail made with Tanqeray gin, St Germain Elderflower liquor, lime juice and muddled cucumber and mint, shaken over ice. Its highly fragrant and refreshing, with loads of cucumber aromatics (and texture) that pair so well with gin. The elderflower’s sweetness is a delicate well-balanced addition. We also sample and recommend the East 8 Holdup: Ketel One Vodka & Aperol shaken with pineapple, lime & passion fruit; a fresh and lively offering. Room choices at Veriu include Queen singles (some with balconies), King singles and King doubles; as well as a larger triple room designed to accommodate a small family or group. Designer furnishings, heavy drapes, plush bedding and walnut veneer wall panelling combine to make the rooms elegant and appealing. Modern kitchenettes and bathrooms are small, yet well designed and functional. We found our room, the Wentworth Triple, to be comforting yet not overly extravagant. Harry’s Dumpling House is a modern space that’s a clever conversion of an otherwise difficult space – set within the former triangular utility courtyard at the rear of the hotel. This is now enclosed with glass ceiling panels; its new interior theatrically themed to appear as an Asian cobble stoned street hawker’s market. There’s a mix of seating including packing-crate inspired stools with cushions, banquette seating plus regular dining tables and chairs. Overhead, a string clothesline art installation features a display of tea towels and shirts arranged to form a colourful visual aesthetic. The room also features sandblasted brick, life-sized prints of Asian market stalls on some walls, and a large neon light with its lines painting a snarling Bengal tiger – its red and yellow glow setting a strong mood within the room. Harry’s handmade dumplings are made fresh daily and offer a light, fragrant after five snack – one that’s offered complimentary with a voucher at check-in. Also included is a glass of regional wine or imported beer. 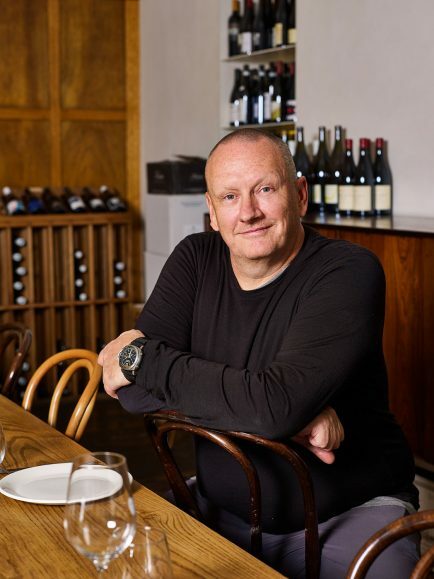 While the dumplings hit the spot, we highly recommend, staying on for a chilli mud crab, the one menu item that makes Harry’s a Sydney food icon. For more details on Harry’s, see our review here. 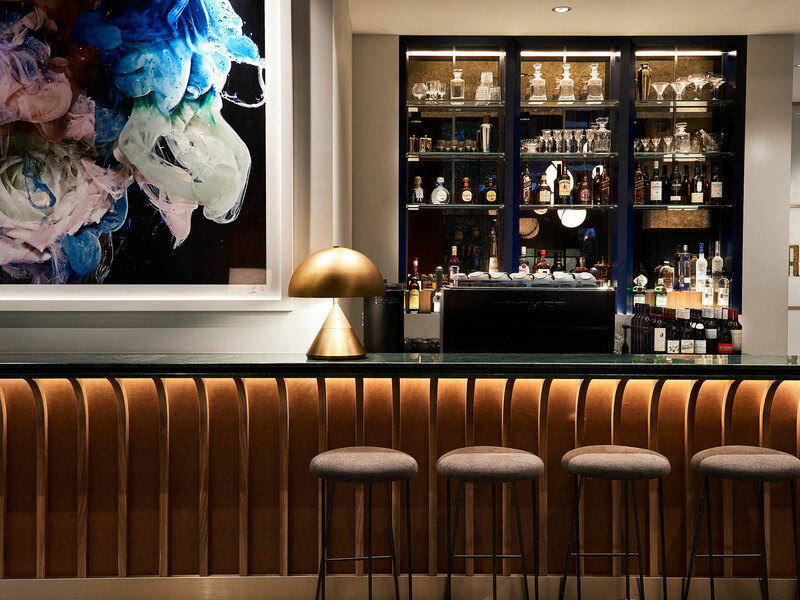 As well as providing the expertly crafted list of cocktails, The Drawing Room also offers a cleverly crated bar snack menu designed for casual grazing. Service is prompt and the quality of offerings high; everything at Veriu Central contributes to make your stay a wonderful experience. All Veriu properties, include a welcome drink, WiFi and in-room tunes via Smart TV technology. Essentials Magazine stayed as a guest of Veriu Hotels.